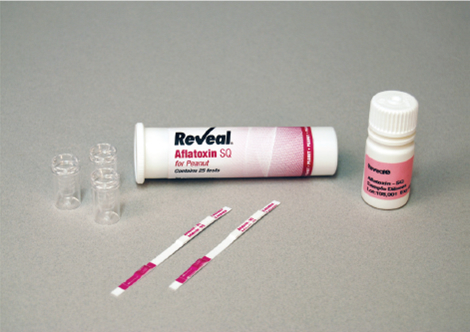 Reveal for Aflatoxin SQ Peanut is a single-step lateral flow immunochromato¬graphic assay based on a competitive immunoassay format intended for the semi-quantitative testing of aflatoxin in peanuts. 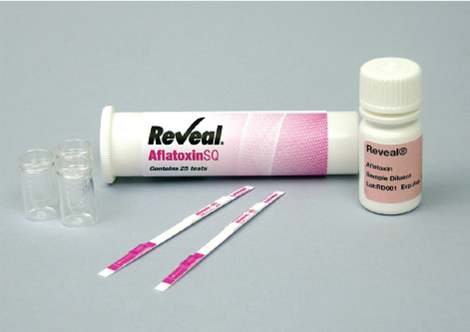 Agri-Screen for Aflatoxin is a competitive direct ELISA that provides a visible screening result against a known control of aflatoxin in such commodities as corn, cornmeal, corn gluten meal, corn/soy blend, wheat, rice, milo, soy, whole cottonseed, cottonseed meal, raw peanuts, peanut butter and mixed feeds. Veratox for Aflatoxin is a competitive direct ELISA that provides a quantitative analysis of aflatoxin in such commodities as corn, cornmeal, corn gluten meal, corn/soy blend, wheat, rice, milled rice, milo, soy, whole cottonseed, cottonseed meal, raw peanuts, peanut butter and mixed feeds. 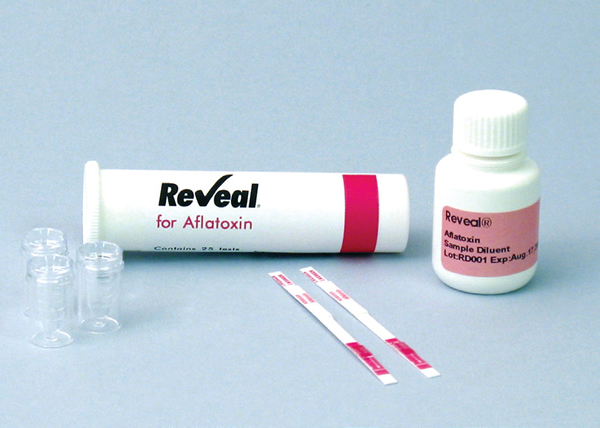 Veratox for Aflatoxin AST (Aflatoxin Single Test) is a competitive direct ELISA that provides a quantitative analysis of aflatoxin in such commodities as corn, cornmeal, corn gluten meal, corn/soy blend, wheat, rice, milled rice, milo, soy, whole cottonseed, cottonseed meal, raw peanuts, peanut butter and mixed feeds. 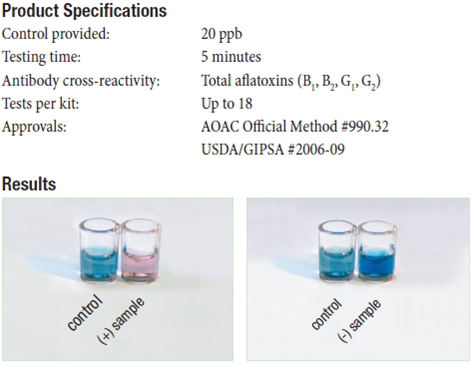 Veratox for Aflatoxin HS (High Sensitivity) is a competitive direct ELISA that provides a quantitative analysis of lower levels of aflatoxin in such commodi¬ties as corn, cornmeal, corn gluten meal, corn/soy blend, wheat, rice, milo, soy, whole cottonseed, cottonseed meal, raw peanuts, peanut butter and mixed feeds. 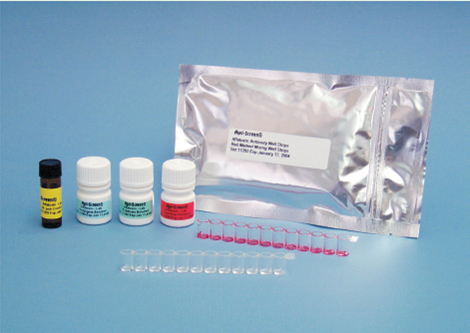 Reveal for DON SQ is a single-step lateral flow immunochromatographic assay based on a competitive immunoassay format intended for the semi-quantitative testing of DON in wheat, corn, barley, milo, oats, wheat bran, flour and midds. Veratox for DON 2/3 is a competitive direct ELISA that provides a quantita¬tive analysis of DON in cereal grains and grain products, such as wheat, wheat flour, wheat midds, wheat bran, corn, cornmeal, corn screenings, barley, malted barley and oats. Veratox for DON 5/5 is a competitive direct ELISA that provides a quantita¬tive analysis of DON in cereal grains and grain products, such as wheat, wheat flour, wheat midds, wheat bran, corn, cornmeal, corn screenings, barley, malted barley and oats. 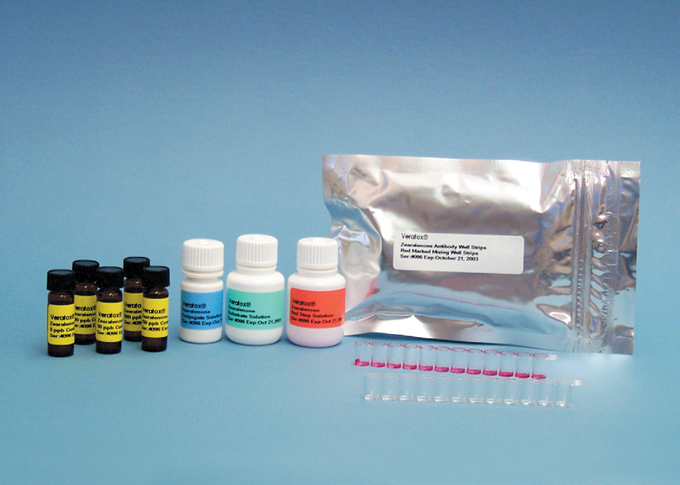 Veratox for DST is a competitive direct ELISA that provides a quantitative analysis of DON in cereal grains and grain products, such as wheat, wheat flour, wheat midds, wheat bran, corn, cornmeal, corn screenings, barley, malted barley and oats. 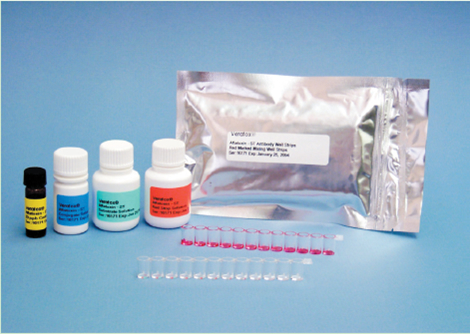 Veratox for DON High Sensitivity (HS) is a competitive direct ELISA that pro-vides a quantitative analysis of lower levels of deoxynivalenol (DON) in cereal grains and grain products, such as wheat, wheat flour, wheat midds, wheat bran, corn, cornmeal, corn screenings, barley, malted barley, oats and processed cereal. 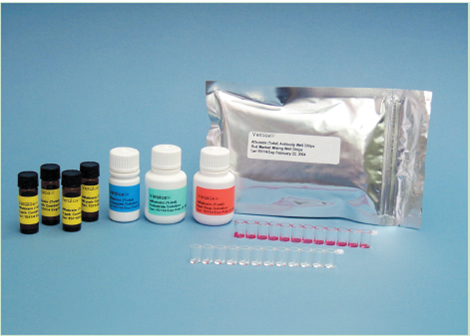 Reveal for Fumonisin SQ is a single-step lateral flow immunochromatographic assay based on a competitive immunoassay format intended for the semi-quantitative testing of fumonisin in corn. 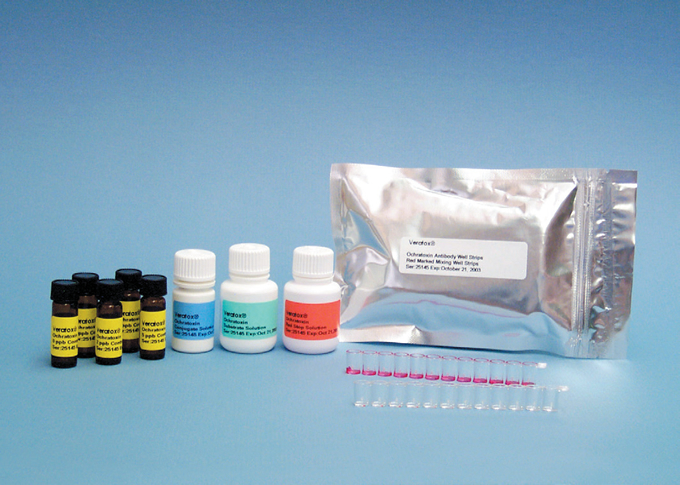 Veratox for Fumonisin 5/10 is a competitive direct ELISA that provides a quan¬titative analysis of fumonisin in commodities such as barley, corn, DDGS, milo, popcorn, rice, soybeans and wheat. Veratox for Fumonisin is a competitive direct ELISA that provides a quantita¬tive analysis of fumonisin in commodities such as barley, corn, DDGS, milo, popcorn, rice, soybeans and wheat. Veratox for Fumonisin High Sensitivity (HS) is a competitive direct ELISA that provides a quantitative analysis of fumonisin in commodities such as barley, corn, DDGS, milo, popcorn, rice, soybeans and wheat. Veratox for Ochratoxin is a competitive direct ELISA that provides a quantitative analysis of ochratoxin in such commodities as corn, barley, wheat, green coffee and various dried fruits. Veratox for T-2/HT-2 Toxins is a competitive direct ELISA that provides a quantitative analysis of T-2 Toxin and HT-2 Toxin in such commodities as wheat, corn, barley, oats and rye. Veratox for Zearalenone is a competitive direct ELISA that provides a quantitative analysis of zearalenone in such commodities as corn, wheat, barley and DDGS.